I have a looked at this match and see if I can find what I consider to be a good value bet. My starting point in most of my football betting is my BetFormPro software. After a quick look though the stats available in the popular markets I find one that jumps off the page. The under/over 2.5 goals market. I like to trade this market. The reason being it is one of the 2 main markets for football betting. If you’re playing on the exchanges the liquidity is high and it’s usually very easy to get in and out of a trade. I interrogate the last 10 matches. 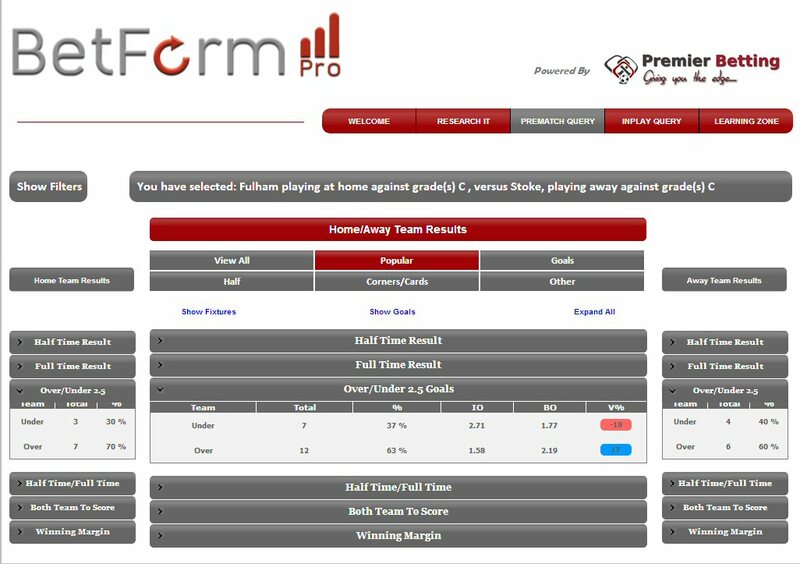 What this does is look back at the last 10 matches played by Fulham at home and by Stoke away against teams of the same standard (grade) as their opposition in this match. When you’re looking back at recent form why is Fulham’s match away to Man Utd relevant when we are looking at a home match against Stoke? With all respect to Stoke, they will not test Fulham at Craven Cottage anything like a trip to Old Trafford to play Manchester United would. That is one of the things that make BetFormPro so accurate. The other thing to note is I could interrogate back 50 or 100 matches or even go back to 2009/10. But I fail to see how that helps me. Fulham’s main players then were Clint Dempsey, Andy Johnson, Danny Murphy and Bobby Zamora. Stoke had Fuller and Sidibe. My point is recent form is more relevant. This is the screenshot of the analysis. As we scan across the over 2.5 goals line we see that 63% of these matches have produced over 2.5 goals, this gives the I.O or Implied odds of 1.58. That means that the “true chance” of overs is 1.58. The next figure is under BO. (Bookmakers odds) shows we can actually back overs at 2.19 giving a value advantage of 17% This figure demands attention. So this on its own looks to be a great bet. However is there anything we can do you make it even better? Yes, of course. Next port of call for me is the goals market. I want to see when the goals were scored. Believe it or not teams tend to score goals in patterns. Some teams are notorious poor starters, while others really go for it from the first whistle. The goals table gives some perspective to this. This table illustrates nicely the first half goals (Fulham home and Stoke away). There are 19 matches in the sample. In the 1st 10 minutes there has been 2 goals (10.5%) and in the first 15 minutes 4 or 21% (There are 2 goals in 1 match, but for this calculation we take the match into account the amount of matches with goals, not the amount of goals). If we move a little further in to 20 minutes 47% of the matches have had a goal in them. This shows clearly that a slow start is likely. How can we now use this to enhance our bet on over 2.5 goals? As you know the odds on under/over 2.5 goals are affected by what is known as time decay. If there is no score the odds on under 2.5 goals will shorten all the way to 1.01 if no goals. The price on overs will subsequently move out. The way I want to use this information is to wait until 10 minutes into the match before I place my bet. The price pre kick off of 2.19 will be between 2.5-2.6 by 10 minutes. If the game is slow and few shots it will be even higher. We are improving the bet by 25%. This gives a bigger margin of error. These bets are not landed every time. But if you get good value and then improve that value by another 25% you have to be on the right side in the long term. It is possible to trade out to lock in some profit if there is a goal. I don’t see any point in this as we lose the value bet we have created. However, saying that, an opportunity to reduce some liability at short odds that may deserve consideration. Value betting is about taking a long term view. It’s important to remember that. Make sure the teams are as you expect them. If a team have made 7 changes from their last match walk away. We are using time delay to enhance our bet, has there been a hold up in the match that will alter the odds. You may need to make an adjustment. Just checking prices. The over 2.5 goals on Betfair have drifted to 2.32. I’m sure this will change again. This moves our target price out after 10 mins to 2.6/2.65. The trade is even better value now. To recap: Back Over 2.5 goals at 10 minutes if no goal scored is the bet I am hoping to get involved in. To help you get an even better price than the 2.55 I have targeted. Have a read of this article about Asian handicap betting. This is about to become one of the biggest markets for sure Over/Under goals markets you may not have considered? The fist part went well, I managed to get matched at 10 mins at 2.7. The goal just before HT gave a small profit if traded out. However, that was not the way the bet was structured. The turning point for me was when Stoke missed the penalty just after half time. Overall very disapointing. The whole point of a value bet is if you are on the right side of value to the degree of this trade, it’s very difficult to lose in the long term. Winning from betting is a long term project. The overall position is what’s important. If you enjoyed reading this and are interested in a FREE trial of this software just click on the banner below. 1) In your experience, when software readily available on the market highlights such a discrepancy between implied odds and bookmaker odds, will the price shorten much pre-match? And if so what sort of tick steam would be about average? 2) I think it’s a bit unfair to say you’ve got a 25% edge on the bet there. This is for several reasons. Firstly the SP may steam so the price of 2.5-2.6 won’t hit by 10 minutes, but more importantly, if we assume that the implied price is 1.58, if it was this to start, this would also have drifted after 10 goal-less minutes. Would be great to get your thoughts on this. Dan, Thanks for your questions which I will do my best to answer. The software is readily available, as are literally 100’s of stats websites. The 2.5 goal market has more liquidity than any market except match odds. So the it influencing the price is unlikely. However, there are plenty of other things that may may more influence on the price. The main one being team news. How many punters do you think go to the lengths that I (and many others I guess) go to to find trades like this? Most are too lazy. Hence losers. £ days out there is a chance of odds movement, but I would not have thought that far. The market has this down as a low scoring match. The most reliable indicator to calculate goals per match is sporting index. The have it at 2.4 – 2.6, which is 2.5. The Betfair odds are spot on to confirm this. To get the overs to move in, Fulham would have to steam in the match odds. Looking at my models I have Fulham more likely to drift than anything and the draw maybe move in slightly. What I am saying is I will have a 25% advantage by waiting 10 minutes as an early goal is not expected. I know exactly what price overs will be at 10 minutes in relation to the starting price. It’s not possible to predict the SP accurately. But when trying to explain a potential bet 3 days from the match I need to start somewhere. These numbers are what are available to me now. The edge will come from waiting 10 minutes, no matter what the SP is. The only variable really will be the difference between the IP of 1.58 and the price we get. I think if you backed overs at 2.2 it would still be a value bet, the goal expectation would need to move to 2.7 and the overs SP to 2 for that to happen. It’s not impossible, but unlikely. What I was trying to do was highlight how a trade can be thought out, and how to use a great tool to find a value bet. When looking at at football markets as one door closes another opens. That’s why its good to have the software and you will have time to check out all the options available to you. Hi MG, I know this is an old post but was hoping you can help. There is clearly a relationship between the sportingindex spread and the fixed odds… you mention that the goal expectation would need to be 2.7 (so 2.6-2.8 spread) for fixed odds of 2.2 to be a value bet. How do you calculate this relationship? Also, by overs SP – you mean overs starting price? Is this the price at the beginning of the match? Fairly new to sportsbetting so any help appreciated! In terms of the Fulham v Stoke match, all the stats come from Betformpro. The software is saying there is a 63% chance of over 2.5 goals, which equates to Implied Percentage odds of 1.58. However this is available at the bookmakers at 2.19. This is where the advance lies. The rest of the piece shows how to enhance these odds using BetFormPro’s data. I can’t see anywhere in the piece that mentions the Sporting Index spread. In my experience the Sporting Index Spreads and under 2.5 relationship is pretty accurate. SP is the starting Price as you correctly identify. No worries thanks MG. Are you still using betformpro? I’m trialling it but find it curious that their blog has sort of died out with the last post being back in October-14. Do you use the asian handicap or in play functionality? Unlucky with this one Mr Mug, Penalty certainly didnt help the cause however after that point Fulham seemed happy with the well needed points and didnt push and Stoke looked dreadful imo. Thanks for taking the time out to reply, really interested in what you’ve said. My main background betting/trading is in cricket and tennis so I don’t have much football experience, so all this is quite a good learning experience for me. Looking forward to hearing more about your football opinions in the future. Thanks Dan. Once you have the foundations and a systematic approach you can make money on anything.